ABA President Frank Keating wrote an Op-Ed piece recently in The Hill entitled New jobs and new growth call for new banks. I don't believe it. A more accurate title should have been New jobs and new growth call for new businesses. His leap-of-faith assumption was that new banks are critical to new business formation. I'm skeptical. Why? I don't think de novo banks are key players to business startup capital formation. Sure, if you cite studies that say these banks' loan books are predominantly small, as the FDIC measures them. But that is because de novo's are limited to making a loan to one borrower of 15% of their capital position. If a de novo starts with $15 million of capital, its largest possible lending relationship is $2.2 million. So the bank necessarily hunts for smaller relationships. I'm also skeptical that small community banks in general are financing startup businesses. 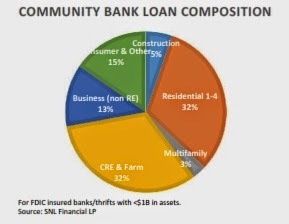 See the accompanying chart for the loan composition for all FDIC-insured banks and thrifts with less than $1 billion in total assets. 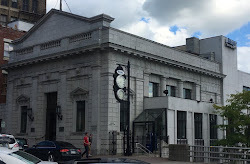 So, if a de novo bank has $100 million in total assets after its first year of operation, and it's loan portfolio was $70 million, then its business loan portfolio would be $9 million, if they achieved the community bank average. And that's all non real-estate loans to businesses, not necessarily startup or early stage businesses. Since I often hear credit people talk of getting three years of tax returns to get a loan decision, it makes me wonder how a 1 year old business can satisfy the requirement. OnDeck Capital, not a bank, will lend to businesses with one year of operating history and only $100,000 of annual revenues. How do I know this? They tweeted it to me. That's right, they tweeted it. I am doubtful many financial institutions would make such a loan. To be fair, the loan portfolio composition in the above pie chart is from Call Reports, which categorize loans by collateral, not purpose. There may be small business loans in the residential category, because the business owner pledged his or her house as collateral for the loan. But I doubt OnDeck or similar neo-banks are requiring such collateral. And OnDeck and similar lenders are growing rapidly in the startup or early stage business financing landscape. So, no, Mr. Keating, I don't think de novo banks, being run and regulated as they are currently, are critical to small business formation. Who wants a regulator to come in for their periodic exam cycle and ask "why did you make this loan"? What banker is running to capitalize an early stage business without real estate as collateral? I don't know of many. Do you think de novo banks are actively participating in startup or early stage business financing?